We decided to brave the drizzle and head over to Hadlow Down, deep into East Sussex, to the Railway Gala at Tinker's Park. I've never been here before but it sounded like a good day out with the kids, and Grandparents too in this case. The highlight is the "Great Bush Railway" - a 2' gauge line that runs around a field, this was running a passenger service with a couple of quaint home-built coaches, and hauled alternately by a quarry Hunslet (built in 2005!) and an Orenstein & Koppel. In addition there was a miniture railway (5" gauge I think) giving rides, some traction engines, and a selection of fairground organs. The workshops were hosting a model railway show with some familiar faces too! Despite the damp weather everyone seemed to enjoy themselves, so a good day out! I did hint that the NRM was not the only railway interest in our holiday last month. We took a ride on the North York Moors Railway from Pickering to Whitby, which means some nice scenary and long trains pulled by big mainline engines over a good distance. The last few miles into Whitby are in fact run over Network Rail lines, which is unusual. A bit different from my usual preference of narrow gauge, but an enjoyable day out. I did spend some time in the model railway exhibition, mostly in the hall normally used to display the narrow gauge locos (they were all out in the sunshine), but also in a couple of the other railway-related buildings. I got there in time to help Rob set up Peny-Y-Bryn Quarry, his first time of taking a layout to an exhibition. He has been sprucing up some of the scenery (still suffering from the damage inflicted by the mice) with some ivy on the granite loader, plus more ballast. Actually he'd got a bit carried away with that, and we had to remove some with a screwdriver where loco flanges were lifting wheels from the track! Still we got it working, including the top level controlled by a shuttle unit. Also on the Sussex Downs stand (representing the 009 society) we had the display case, with the oval of track we display with it, and Tim had a new project building a layout in an old stereo cabinet. Mind you, much of the day you'd have been lucky to find one of us there, such were the attractions outside! I did spend a couple of sessions operating Pen-Y-Bryn though, and cursing the short sidings where the uncoupling magnet was always in the way, and the granite chippings going everywhere while loading the trucks. Especially with a 3-year-old "helping" me with that bit!! Still since I built the layout I couldn't complain. I did get round the rest of the exhibition too, albeit as usual having a toddler in tow isn't the easiest way to see layouts, especially when he was so excited by the real trains outside! There were some good layouts on show, representing narrow-gauge lines of course, and I picked up some interesting (and obscure) books from one of the traders too. 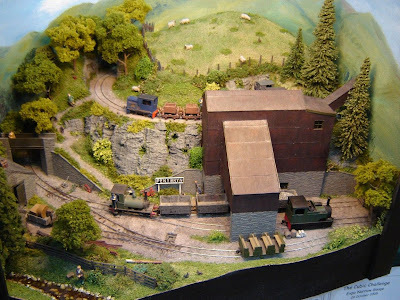 "The Chalk Pit" by Nigel Lawton is a great model of ... well, take a guess. Of course it is also a superb showcase of his own range of tiny internal combustion locos and skip wagons - remember this is 009! Real watch-maker stuff. Pagham Harbour is one of my all-time favourite layouts, another case of less-is-more producing loads of character. This is the latest version, a complete rebuild on a larger board, although with the extra wharf it is slightly more crowded, but no doubt more interesting to operate too. It has lost none of the character though! You can see more of my pictures of the exhibition and the gala here. As always I get home and wish I had taken more, but I was too busy enjoying the show! Amberley Railway Gala - The Big Trains! So yesterday I spent the day at the Amberley Railway Gala. I was supposed to be helping with the 009 Society stand, manned by the Sussex Downs group, but since I had taken my 3-year-old with me - and the sun was shining - I probably spent more time outside. If you like small industrial railways the Amberley is always a great visit, but for the gala everything that can move does, and also one or two visitors. Polar Bear was one of the two resident steam engines running the passenger services. Taking full advantage of the new (a couple of years back) 3-station layout the track was chocablock with two passenger trains, and internal-combustion (and battery) loco's taking turns to slot in between with some trucks. Joshua loved riding the trains (unsurprisingly for a 3-year-old boy) so we did several times - and was so excited when he was allowed to pull the whistle of Polar Bear! Visiting this year was Darent, an Andrew Barclay. I believe it has been extensively re-built and the cab and saddle tank are probably not original - perhaps someone who knows could post about this loco? Anyway, very attractive it is too. The other loco on passenger duties was Peter, a Bagnall saddle-tank that was originally built for 3' gauge, then later regauged to 2'. At Amberley it looks massive (compare to the photo of Polar Bear against the same platform!). Riding this train was fun, the coaches (mostly open) were loose coupled - meaning at every start and stop the passengers had to suffer violent jerking! Perhaps seat-belts would be in order? Or just some solid-link couplers like Polar Bear's coaches. Passing the sheds after the calvacade a number of the locos are visible. It didn't seem overly crowded this year, so we had a great spot - sat on the grass in the shade - during the calvacade, where we got to see all the locos up close. Both of us really enjoyed the day. The Railcar has been with my friend Rob Kaczmarczyk for painting, and today I got it back. And he has done a great job! Despite the fact that all my other passenger stock is green, this railcar seemed to suit red best - although I have no idea why! And so red it is. I also wanted a "wiped-clean" look, not uncared for, but a well-used look. Rob's sublte touches with the airbrush have really brought out the panelling and underframe detail. All it needs now is the couplings re-fitting (in case of a luggage trailer being required), and of course some passengers! Rob takes commissions so if you are interested, check out some of his other work. Pen-Y-Bryn will be appearing at Amberly this weekend as part of the 009 society stand. It's new owner (Rob Kaczmarczyk) tells me he has been sprucing up the scenary and repairing damage inflicted by the mice, so it should be ready for it's first outing in several years! I expect to be there on the Saturday too, although probably as much as an excuse to look around and enjoy the trains as to actually man the stand! Still, say Hi if you are there. We've just got back from a family holiday near York - and of course that meant a visit to the National Railway Museum. It's a llong time since I have been (well, since I was a child), these days the bonus is the museum is free! It is in many ways a "traditional" museum - lots of interesting things to look at but not much in the way of interactive stuff (in fact the kids interactive area was closed, which was a shame), however my little boy loved it, and so did I. So there are lots of obvious attractions like the Rocket replica, and a very interesting display of Royal Train coaches, but of course I liked the more obscure stuff, like this ancient Black Hawthorn saddle tank, preserved in the state that the museum acquired it. That is, run-down and weathered! That would make a super model. I even found some narrow gauge interest too, such as the Ffestiniog double-Fairlie Livingstone Thompson, and this odd little 18" gauge loco. And another un-restored exhibit is this Lynton & Barnstaple Railway coach, as found in a garden! A good family day out then!